Mother Angela Strobel announced the election of Sr. Mary Thomas Prado as the new Prioress of the Windhoek Priory. 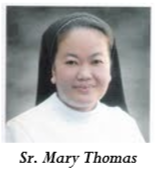 Sr. Mary Thomas is from the Manila Priory. Shortly after her final vows, she was sent for studies in Psychology at the Pontifical Gregorian University in Rome. She also received her doctorate on ministry major in Cross-cultural Ministries at the Catholic Theological Union in Chicago, USA. Sr. Mary Thomas was President of St. Scholastica's College, Manila before her election as Prioress of Windhoek. Her installation as prioress will take place on November 15, 2014.